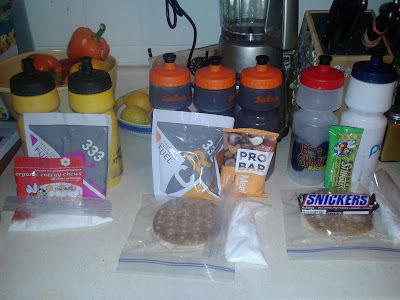 Over the past few weeks I've gotten some questions about what I eat/drink during endurance events like adventure races and gravel rides. I LOVE answering these questions. I think endurance nutrition is really, really interesting so I enjoy talking/writing about it. 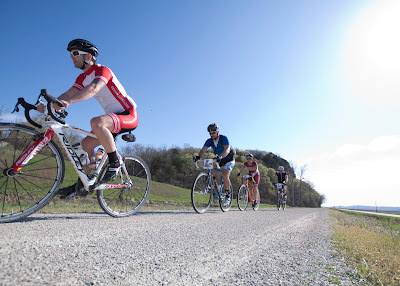 With the gravel season really taking off here in Missouri, hopefully this will help those of you getting ready for the OGRE, Cedar Cross, and Dirty Kanza. 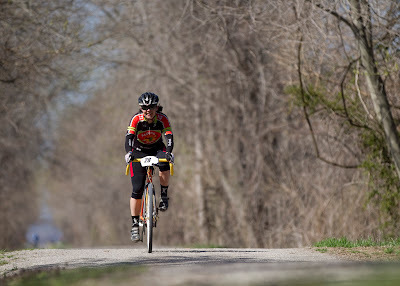 I'll use my experience at this past weekend's Tour of Hermann Gravel Challenge as an example of how to plan/execute a nutrition strategy, as well as some things I learned and would change for next time. To give you some background, the ToHGC is a 2-day event. Day 1 had 3 loops of about 30 miles each. Day 2 had 2 loops of about 50 miles each. We stopped at Race HQ between each loop to refuel. Course maps and profiles were posted before the event. 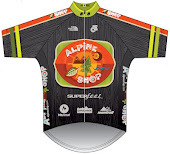 I looked at the course maps and profiles and compared them to recent training rides I've done. The amount of climb really affects my overall average speed, which affects my total time, which affects how much fuel I bring. IMPORTANT!!!!! You'll see in the table above that I have three columns for climb (in red). I've noticed that MapMyRide significantly underreports climb (column G), so I made my own estimate of climb in column I. Once I had distance and climb numbers, I estimated my average moving speed (column J) which is based on recent training rides. That average moving speed will give me the estimated duration (column O). Then, I use my current calories/hour and ounces/hour values (at the top of the spreadsheet in orange) to calculate calories and bottles for each loop. Admittedly, there is a lot of math going on behind the scenes here, but it's all boring multiplication/division. Anyway, if your eyes glazed over with the first mention of "column" and "equation", the main takeaway from this planning exercise is how many calories and how much fluid I would need per loop at ToHGC. Every person has their own needs and I would expect that calories/hour and ounces/hour would be different for just about every rider. For smaller riders (i.e. most chicks) I would say that 250 cal/hr is on the higher side of things, but my gut is quite happy processing that amount. For people who sweat a lot (i.e. Jeff Sona), 20 oz/hr might be woefully inadequate. Also, if this ride was in July, I'd probably increase that number myself. OK, so we've got our calorie and fluid targets for each loop. Now, let's pick what I'm going to put in my bottles and pockets. Loop 1, Loop 2, Loop 3. CarboRocket Half-Evil, aka CR333: my #1 go-to fuel for liquid calories. Has a bunch of BCAAs (which are building blocks of protein) and also caffeine in some flavors. Skratch: something new I'm playing with this year. Not a lot of calories but plays nicely with solid foods. nuun: I love this stuff. Adds electrolyes and a pleasant fizz. So many flavors!! Honey Stinger Chews: I like the way these gummies taste. Turkey sandwich: just yer basic turkey and cheese sammy on a flatbread bun. I put some Boetje's mustard (from Thunder Rolls) in there for added flavor. ProBar: super calorie dense!!! awesome flavors and made with ingredients I recognize. Snickers: I have a junk food weakness. That is all. I packaged all of these up in 1 larger bag for each loop, then put everything in a cooler which I kept right next to the timing table at Race HQ. Then, when I finished a loop, I didn't have to hunt around in my car for next loop's fuel. It was just a matter of swapping bottles and re-filling my pockets. I spent less than 10 minutes total at Race HQ on Saturday, and was able to finish ahead of several faster/fitter riders because they took longer pits than I did. One more note, I kept an "emergency snack" with me during the whole day. It was 1 caffeinated gel, 1 Foosh mint, and 1 Honey Stinger protein bar. 300 calories of bonk prevention right there, just in case something happened and I was out on the course for longer than planned. And I did need the caffeinated gel in the middle of Loop 3. I was tired, alone, and generally not enthused about riding. When this happens to me, it is a red flag that I need calories. Do not mess around here. I ate the caff gel right away and within a few minutes was cruising along in a much happier state of mind. Endurance events are SO MUCH MORE pleasant when you are topped off on calories and fluids. There is NO REASON why you should be out there feeling miserable. 9 times out of 10 it is just a sign you need to eat more. Photo by Dan Singer who is just amazing. After the ride, I took stock of things that I liked and didn't like. I ate everything I brought, plus the emergency gel. I make a mistake of not bringing any caffeinated product with me on Loop 3 (besides my emergency stuff). I should have realized that late in the ride I would need the extra focus that caffeine gives me. Luckily I had a couple back-up sources on board so that mistake was easily fixed. Oreos!!!!! regular, birthday cake, peanut butter, they're all good. Okay, so I've got all this stuff to eat, now the question is when to eat it?? When I was first learning about endurance nutrition, I found a really helpful article that advised "When you feel good, eat". So that is what I try to do. I listen to my tummy and when it feels good, I eat something. I try to space out my fluid consumption evenly across the ride. More basic math...if I brought 2 bottles then I need to finish the first one about halfway through the ride. I'm #3 in this train. Photo by the amazing Dan Singer. liquid delivery aka bottles or bladder? pack or no pack? I'm impressed by the forethought put into nutrition. I need to start doing the same, off to play in Excel. Your posts are like my AR bible! This is just the kind of info I need going into DK...now to actually put it into action! Great tips, EK! Going to give some of these calories a try this season.